Ever since my needle stick drag and drop was featured on Articulate’s eLearning Heroes website I’ve had several people asking me to explain how I made it. 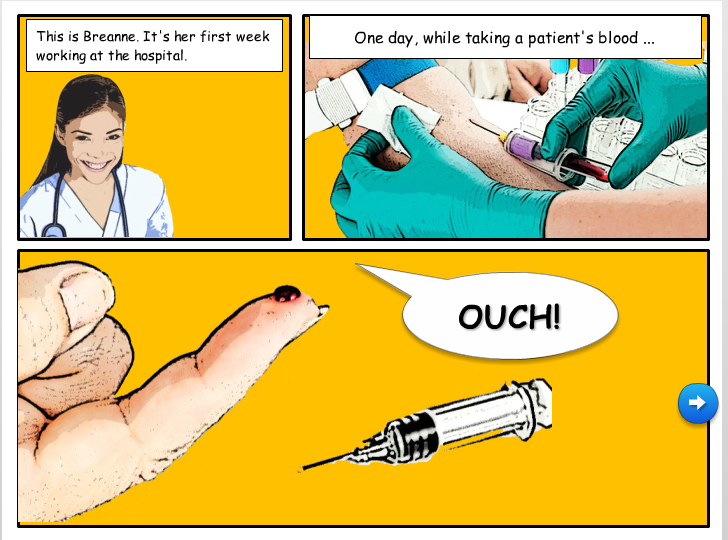 Articulate asked me to write an article for their website about using a comic format in elearning. I made several videos for this, including one that explains the drag and drop feature on this particular interaction. As this video won’t be included in the final article, I thought that I would post it here in answer to your requests, sorry for the delay. This video should explain it all, but if you have any further questions, post them below and I’ll get back to you. Thank you for this tutorial. How did you make the main cartoon have the look it has? I’ve been tinkering around in Photoshop, but I can’t quite get the same effect. Thanks for any insight.